50 Pistol cal dies are designed to work with a gas check shank mold that drops a cast bullet with a .473″ gas check shank only, and optimized for .014″ thick metal. Amerimax .014″ aluminum makes excellent gas checks for pennies. The standard gas check shank mold for .501 50 caliber pistol (500 S&W) etc., Checkmaker™ dies will only work with a modification to your mold. Standard 50 cal cast bullet shanks are designed to use .022 metal which is expensive. 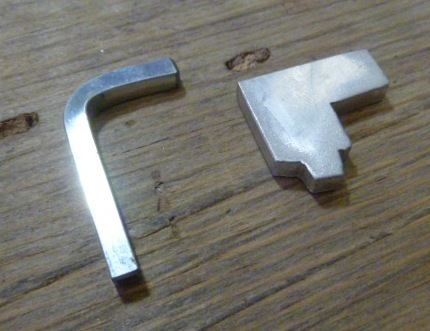 I designed Checkmaker™ dies in standard 50 caliber (gas check shank molds) to work with inexpensive thinner metal. You need to order a 50 cal mold with a .473 shank, or have your mold shank opened up to .473. This way you can use inexpensive metals from .010 to .016 and the best performing .014 Amerimax Aluminum. Again- the 50 cal standard Checkmaker is not designed to make a gas checks with (expensive) .022 thick metals. However, all Checkmaker™ 50PB caliber (plain base) version dies are designed to work with no mold modifications. 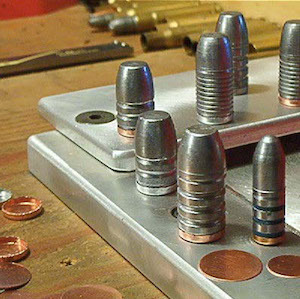 You can make PB gas checks with up to .014 metals to fit any 50 caliber pistol plain base dies.